Are You Aware of the Signs and Symptoms of Sleep Apnea in Bartlesville? Did you know that an estimated 1 out of every 4 adults in the U.S. has sleep apnea? You probably associate this common condition with snoring and restless nights, but there’s much more at stake! In fact, sleep apnea in Bartlesville contributes to high blood pressure, stroke, diabetes, obesity, and heart attacks. Some doctors have said that sleep apnea triples a person’s risk of early death. Thankfully, there are simple, non-invasive treatments that reduce all of these risks, but the first step is recognizing the signs and symptoms. Since Sleep Apnea Awareness Week is this month from March 10th through March 16th, it’s the perfect time to get information that just might save your life! Do you want your family to have healthier teeth and gums? Of course you do. A great way to start is by making appointments with your children’s dentist in Bartlesville. While you’re at it, have your children pick out new toothbrushes designed to remind them of their favorite characters. Wrap it all up by making a fun color chart, trying a plaque disclosure test, and hosting a sugar-free celebration. There is no better way to set the tone for a tooth-positive 2019. Have you been told that you snore while you sleep at night? If so, it could be a warning sign that you have sleep apnea in Bartlesville. A condition that affects over 22 million Americans, it can cause serious health problems. Sadly, though, 80% of the people with sleep apnea go undiagnosed. 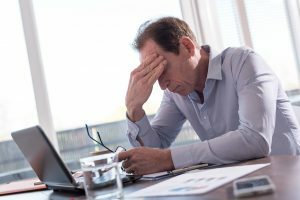 Find out what the dangers of not treating the condition are as you read on. There’s nothing like the holidays for putting a smile on your face. But smiling is the last thing you feel like doing when you’re suffering from a toothache or other dental condition. 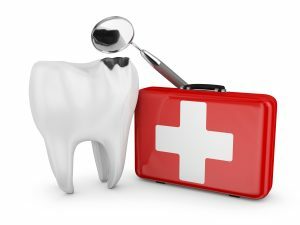 Following a few suggestions from an emergency dentist in Bartlesville can spare you from needless suffering while you enjoy your seasonal celebrations. Halloween – a night of costumes, candy, and fun! What’s not enjoyable is a cracked or decayed tooth that is the result of Halloween treats. 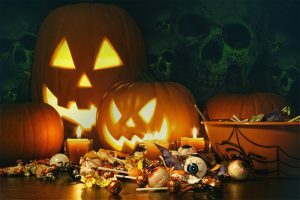 However, all is not lost, because your children’s dentist in Bartlesville has some helpful tips on how your family can keep Halloween both safe and fun. Read on! Did you know that empty calories from added sugars and fats contribute to 40% of daily calories for children and teens ages 2 to 18? This directly affects the quality of their overall health and their oral health as well. 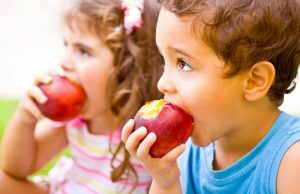 It’s up to you as a parent to make sure your children have nutritious snacks to keep their teeth and gums healthy. Keep reading to learn why your son or daughter should avoid unhealthy snacks and what you can do to help from a children’s dentist in Bartlesville. Whether you’ve had missing teeth for years or had teeth extracted recently, it can be quite jarring to have either a partial or full denture suddenly in your mouth at all times. Most people have difficulty adjusting to the fit of their denture, especially in the first few weeks of wear. Luckily, there are ways to make this process smoother and therefore more pleasant overall. The next time you wake up in the morning, consider these five steps to make wearing your dentures in Bartlesville an easier process. Here’s When An Emergency Dentist in Bartlesville Says Not to Wait! There you are, enjoying a leisurely lunch with your spouse, when all of the sudden…crack! Not only do you have a small piece of a filling in your mouth, but your lunch turned out to be not-so-leisurely after all! 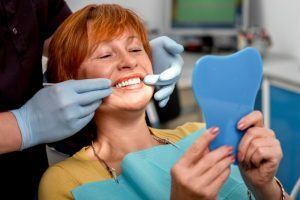 If you’ve ever found yourself in a situation like this, you know that it can be hard to know if you should seek out immediate dental care or not. As an emergency dentist in Bartlesville, we’ve provided care for countless patients in urgent situations. We thought we’d write a blog to clear up any confusion about when you should pursue immediate care and when you can wait, so keep reading to learn about common emergencies and how to handle them! Teeth Whitening in Bartlesville Helps You Start 2018 With Style! What is the best accessory? Is it a designer handbag, a cool pair of sunglasses, or a fancy European watch? No, no, and no. The best accessory is a great smile! You never have to worry about forgetting it at home, and there’s an ironclad guarantee that it will never go out of style. If you want to give your smile a bit of TLC and make it look better than ever, consider professional teeth whitening in Bartlesville. How does it work, and how long can you expect it to last? It’s tough dealing with missing teeth throughout your day. Simple tasks like eating and even speaking can be difficult. You may have noticed your face is having a more sunken appearance and your jaw often feels weak. When it comes to tooth-replacement options, your dentist in Bartlesville doesn’t want to leave you hanging to dry. 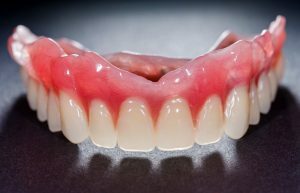 Dentures and dental implants are both ideal for replacing teeth, but couldn’t be more different in terms of production and treatment method. Your dentist wants to make that decision as easy as possible. After all, the highest priority is improving your quality of life.